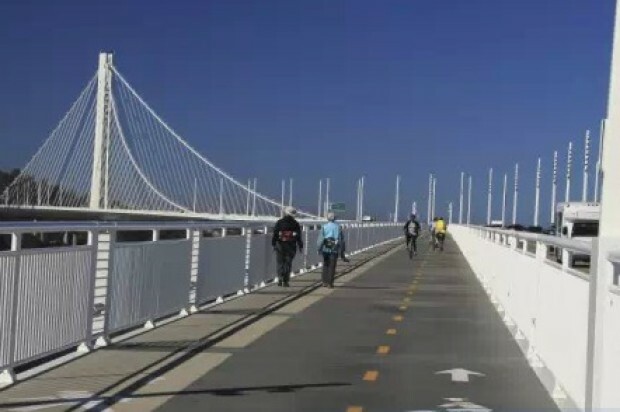 Starting Friday the Bay Bridge bicycle and pedestrian path on the eastern span of the bridge will have set hours, a bridge spokesman said. The path will be open from 7 a.m. to 5:30 p.m. 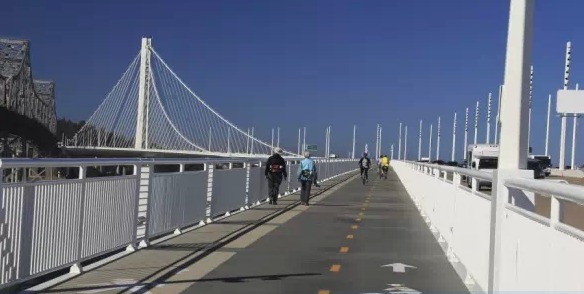 The pedestrian and bike trail has two starting points at Shellmound Street in Emeryville and Burma Road in Oakland and continues until nearly the end of the eastern span before coming to a dead-end. Since the path’s historic opening in early September, pedestrians and bicyclists have been allowed to travel on the path from “dawn to dusk,” bridge spokesman Andrew Gordon said. With the end of Daylight Saving Time arriving Sunday and darkness falling earlier in the evening, bridge officials decided to implement “some specific hours so everyone is on the same page,” Gordon said. The fall and winter hours will stay in effect until March 1, at which point new hours will be determined. Gordon advised those planning to walk on the bridge in the coming months to head out before 4 p.m.
“Give yourself some time to walk,” he said. The California Highway Patrol, which monitors the path will start clearing the bridge at that time, and for most roundtrip walks Gordon advised setting aside at least an hour and half to complete the 4-plus mile jaunt. The same hours apply for bicyclists, and signs will be put up along the path, Gordon said. “We want to make sure people are aware,” he said. More information about the Bay Bridge and the walking path is available at baybridgeinfo.org/bicycle-and-pedestrian-path.